Work will begin this spring on a massive gondola that will straddle the Swiss-Italian peaks in Zermatt and Cervinia. 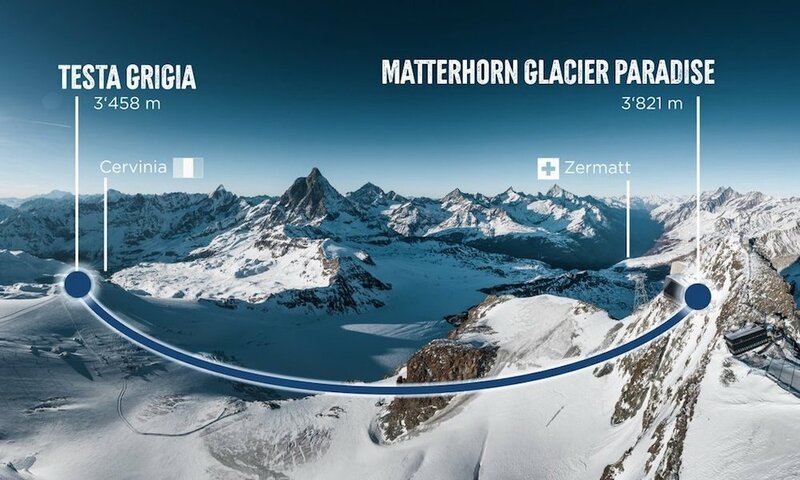 The 3S lift between the Klein Matterhorn (3,821m) in Zermatt and the Testa Grigia (3,458m) in Cervinia will become the highest Alpine crossing and make it possible for people to travel across the border without needing to ski or hike. The new lift, capable of transporting 20 people at a time, will go into service in spring 2021, and follows on from the completion last autumn of the “Matterhorn Glacier Ride” — the world’s highest 3S gondola lift up the Klein Matterhorn. The new ultra-modern, highly stable lift is part of a project known as the “Alpine Bridge” which has long been in the planning. The buildings will be clad in wood and constructed to give easy access to wheelchair users and allow people with heavy luggage to use the lifts, too. While ironing out final details of the project, Zermatt lift company ZBAG has agreed to remove a lift that was created to transport materials up from Cime Bianche in Italy to the Klein Matterhorn, and to remove the current cross-border lift, the Grenzlift, which is currently used during summer skiing on the Zermatt glacier. ZBAG says neither lift will be needed after the new lift begins operating in any case. When opened in Spring 2021, the full “Alpine Crossing” will be a 4,000m-long journey between Switzerland and Italy that tourists can do without even getting their feet wet — though sections are no doubt going to be used heavily by skiers and snowboarders. The news will also excite those who dream of a lift between Zermatt and Champoluc, in the Monterosa ski area.